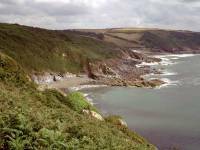 The twelve mile walk from Portloe to Mevagissey is a rewarding one, for this is a section of great diversity and many contrasts. 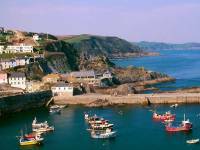 It starts at a remote village and ends at a tourist honeypot, and in between it visits cliffs, coves, villages, beaches, pastures, heathland, a cluster of dream cottages and a castle. 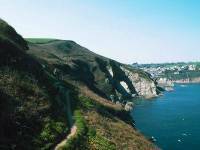 And it boasts two of the best viewpoints along the entire coast path. Dodman Point, half way along the walk, is a significant staging point on the coast path; essentially it marks the transition from west Cornwall to east Cornwall, the point at which you leave behind the hinterland of Truro, Penzance and Falmouth and enter that of St Austell, Looe and Plymouth. 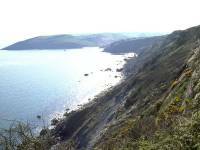 From the hill above Chapel Point, St Austell Bay lies clear before you, and on good days the view sweeps onwards past Fowey and Looe all the way to Rame Head just six miles short of Plymouth. 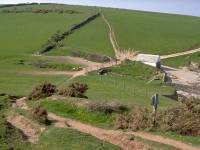 This transition has one downside, however, which is that those who plan these walks as day trips from a single base are faced with a long inland journey at one end or the other. 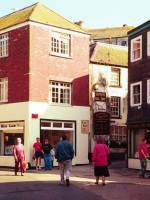 Truro is perhaps the best base for the walk. 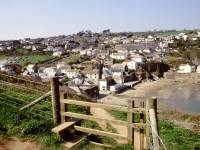 Portloe is a very compact little village, crowded around the harbour and packed into the deep little ravine behind it. Despite being on a bus route it is a long way from any main road and is consequently rather isolated. 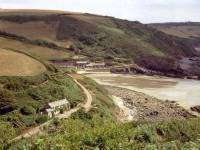 However, even as I write this, Portloe is enjoying a new lease of life as a film set. It's the fictional "St Gweep" in the BBC TV comedy series "Wild West", starring Dawn French. 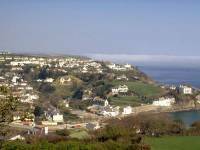 Portloe has some B&B and also boasts a hotel, though an expensive one. 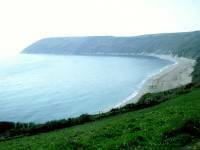 If you're not B&B-ing or backpacking, the chances are that you will arrive here by bus or taxi from Truro. It won't take very long to look around. 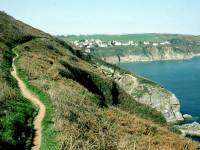 The route of the coast path away from Portloe is obvious enough, leading around the headland immediately east of the village and climbing fairly steeply. 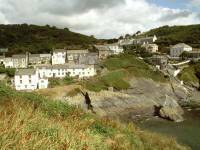 Portloe's isolation is emphasized by the character of the terrain to either side of the village. 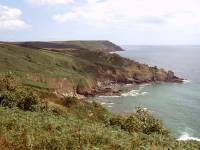 The next two miles, before Portholland is reached, are among the wildest of the entire South Cornwall coast. This is a world of rough rock scenery and scrubby vegetation and the mood is that of a land forgotten and untamed. 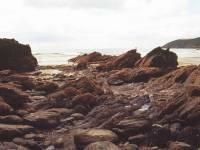 There is not much in the way of cliff scenery but the foreshore is unusually rocky and jagged, with lots of spits and rockpools and offshore islets. 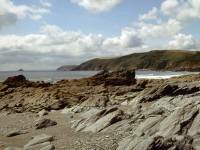 Half a mile out of Portloe you pass the jaggy spit of Hartriza Point, then some 600m further on you round a little cove and see the forward-pointing tongue of rock that is Caralgoose Point. Immediately beyond Caralgoose Point is a rounded hill topped by a small stand of trees. The coast path contours around the side of this hill to reach a section, pretty nearly a mile long, of unusual roughness and scrubbiness even for the Cornish coast. 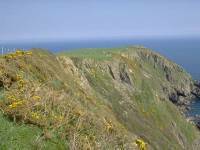 These cliffs and slopes lay seawards of the locality of Treganna, which is unseen and in any case consists of no more than a couple of farms. The vegetation becomes quite dense, to the extent that it becomes heath rather than scrub, and even verges on woodland in parts. Eastwards of Treganna you descend into a scrubby ravine descending from Treganna Farm then climb out again as you begin to round a nameless cove. 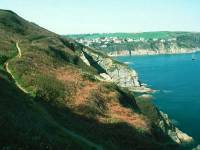 Watch for the coast path as it turns abruptly left and climbs directly away from the coast to ascend to a ridge about 300m inland. 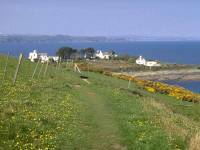 The right of way turns right to run down this ridge, towards the small cluster of buildings that is West Portholland. 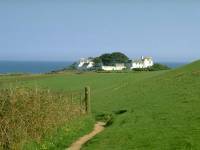 There is very little to West Portholland, and the only facility of any interest to the walker is the bench seat that offers the first opportunity for a refreshment stop since Portloe. 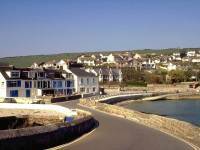 Most Cornish coastal villages are charming, but West Portholland is unfortunately one of the exceptions. 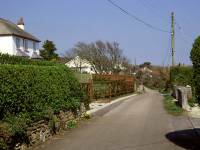 A short stretch of motor road, divided from the coast itself by a strip of scrub covered dunes, brings you to the slightly larger and more welcoming East Portholland. There's a shop here (so you'll get your well deserved ice cream if it's a hot day) and a fairly decent beach that becomes rather bouldery at its eastern end. 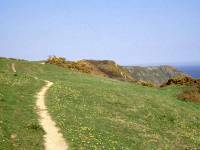 Look for the coast path marker near the shop and cottages and follow the path up to the headland beyond the village. 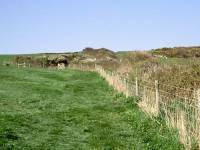 Once it rises to the clifftop it enters a pasture and gradually tends inland, heading for a gate at the northeastern corner of the enclosure. 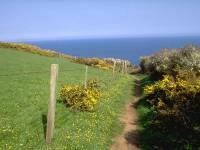 Once through the gate you have two choices; follow a fieldside path in the same direction for 300m to come out onto the approach road to Porthluney Cove, or turn sharp right to return to the clifftop and follow the coast around to Watchhouse Point, overlooking the cove. 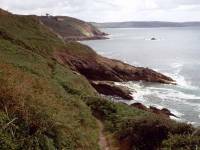 From this point the coast path turns left to run alongside the western side of the cove to come out onto the road at its northeast corner. 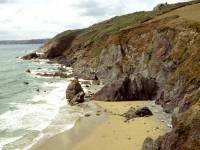 Porthluney Cove is quite extensive, and comes as something of a surprise; it is an oasis of soft, pastoral country in the midst of this otherwise wild and rough stretch of coast. 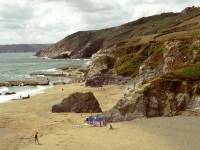 The cove is pretty well square in shape with a shallow and extensive beach, and will perhaps remind you a little of Polldubh or Maenporth in this respect. the big difference, however, lays immediately to the north. 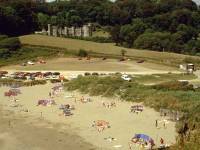 Porthluney lays at the foot of a short but lovely river valley, extensively wooded - and, right behind the beach, is the handsome structure of Caerhays Castle. The castle is relatively modern, an early nineteenth century creation of the famous Georgian architect John Nash. The gardens, famous for their magnolias, are open to the public in March, April and May; the castle itself is a private residence but is open on weekdays afternoons from mid March to late May (all details on the Caerhays Castle website). The woods north of the castle are private, unfortunately. 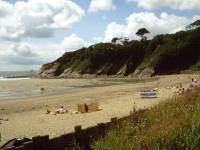 The beach is also part of the estate and is technically private, but public access is allowed at all times. From Porthluney Cove make your way to the northeast corner of the car park, well back from the beach, to find the coast path rising directly up a sloping grass pasture. 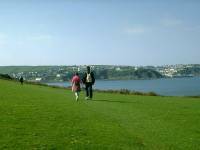 The path bears right to swing round the eastern edge of the cove, and this vantage point gives an excellent view of both cove and castle and is also an agreeable spot for a picnic if you feel like lunch. From here on the coast gets wild again. 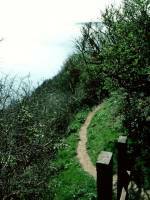 The path hugs the lip of the land for a little way then curves around a spur of land, partially wooded, coming down from Tregavarras. 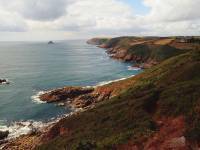 From here you look across the rocky Lambsowden Cove to a falling spit of land called Greeb Point. 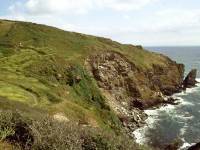 The path drops into the cove to cross a small stream by a footbridge then climbs out again, surrounded by scrub. 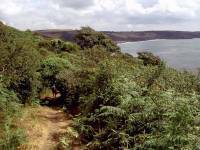 Once you cross the spur of land falling to Greeb Point there's a further kilometre of wild coast, passing a second Black Rock, then Clitter's Rock, then Cadythew Rock, before the terrain softens again and some pasture appears among the scrub. You merge with a road coming down from Boswinger, about 500m inland, where there is a youth hostel and a campsite. The road runs hard by Hemmick Beach, a secluded stretch of sand some 400m across surrounded on three sides by rocky walls. 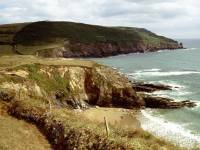 The road is too narrow to allow parking so any visitors to the beach have to walk in, either by the coast path or along the road from Boswinger or Penare (both within a kilometre of the beach). 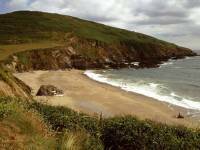 Before you get to Hemmick proper there is a smaller, un-named sandy cove, separated from Hemmick by a feature called Cadythew Rock. 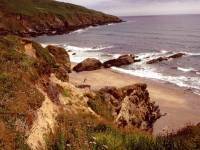 After the little pool of activity that is Hemmick Beach, the coast path gets back into wild country again. We're approaching the heathland dome of Dodman Point, the tip of which lies a mile's walk beyond Hemmick. 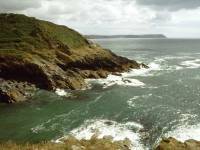 Dodman Point is a strategic headland; it's not only one of the boldest outthrusts of land on the south Cornish coast but also one of the highest, reaching an elevation of some 360 ft. In consequence the views are glorious. 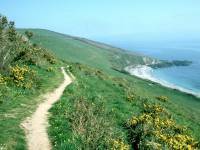 On the clearest days you should be able to see back as far as the Lizard and as far forward as Rame Head - exactly 99 miles of coast! However, Dodman does stand in some isolation. 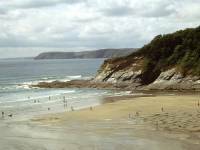 Much of the view back to the west is blocked off by Nare Head on the other side of Veryan Bay, while to the east the nearby outthrust of Chapel Point blocks off much of the vista of St Austell Bay. 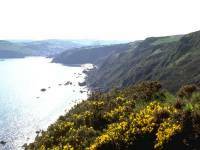 The views from Dodman are mainly of distant headlands, made formless by haze; a panorama of shadow rather than substance. Dodman is also wild and windswept. 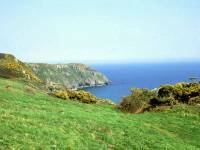 It is uncultivated and is cloaked by heather, gorse and bracken, though it carries a couple of Iron Age earthworks and the remains of a hill fort. 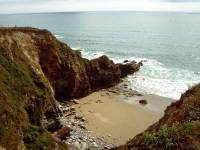 It should also be noted that thanks to its elevation there is quite a stiff climb away from Hemmick Beach, and quite a sharp descent towards Vault Beach on the far side. 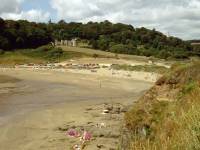 It's another mile from Dodman Point to Vault Beach. 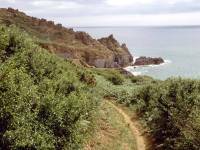 Rounding the headland itself, you then walk along its eastern side, still among scrubby heathland vegetation. 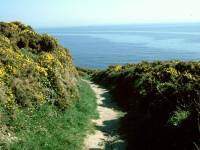 The path runs almost due north, for the best part of a mile, before you reach the far side of the headland and the coast curves around to the east again. Nestling within the curve is the long, thin, crescent of sand that is Vault Beach. 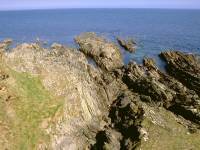 Having walked around the three sides of the Dodman you're still only 400m from Penare. There's a change of mood now, and as you cross a stile the heather and gorse are left behind for an area of downy grassland that rises away from Vault Beach. 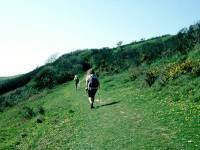 Strolling across these downs is a pleasure, and if you've been looking for somewhere agreeable to sit down for a refreshment stop there's nowhere better. 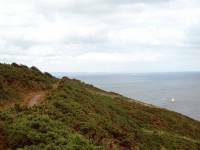 The outskirts of Gorran Haven lie unseen just up to your left over the top of the rise, but the coast path takes a more roundabout route. Vault Beach ends at a spit of rock named Cadythew Rock (a confusing duplication of a name encountered barely two and a half miles back), beyond which is the tiny bay of Little Sand Cove. 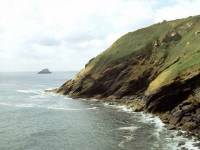 The cove, in turn, ends at the headland of Maenease Point, an abrupt little boss of rock jutting sharply eastwards. 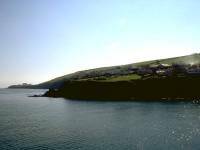 As you round it you come into a nameless bay, some 2km across, and see Gorran Haven not far ahead. 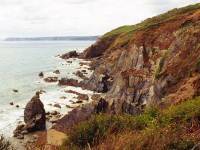 The short stretch of coast between Maenease Point and Gorran Haven is quite dramatic and contains some splendid cliff scenery. There's a fair bit of effort involved here, because the coast path has to rise quite steeply to get above the vertical face. 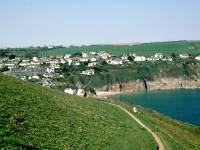 Once past the cliffs you see Gorran Haven and its little beach and harbour. 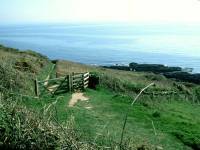 Cross a stile to gain a grassy terrace above the village then go down a short flight of steps into Gorran Haven itself. 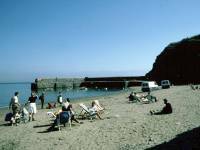 Gorran Haven is a pleasant little place. 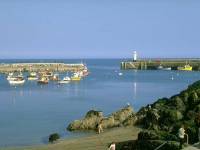 It's largely residential and doesn't specifically target the tourist, though you will find most of the usual facilities here (cafes, pubs, toilets, shops, accommodation). 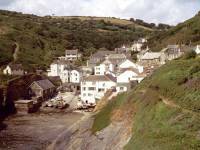 Gorran Haven is served by the St Austell - Mevagissey bus service. From the centre of the village make your way a short distance along Church St then turn right into Cliff Road, a residential street. 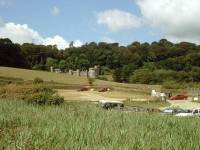 At the edge of the village you come to an expanse of grassy pastures, which steadily gain height along the walk out to Chapel Point. 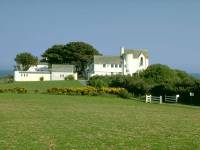 Chapel Point is, like Dodman, a high dome of land thrusting out from the general line of the coast. It's not as high as Dodman, and unlike the latter headland it's cloaked in grass rather than heather, and faces east rather than south. 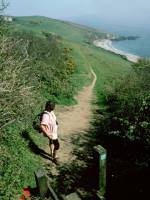 It marks another major staging post on the coast path, for it forms the southwestern extremity of St Austell Bay. 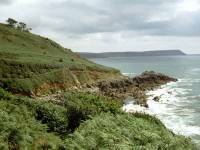 As you progress towards Chapel Point past the unseen Perhaver Beach, views begin to open up to the north and east and soon a splendid vista across St Austell Bay is revealed. 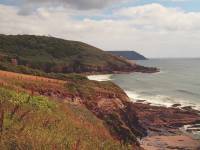 This stretch between Gorran Haven and Chapel Point is most rewarding. 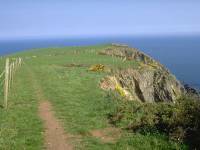 The walking is easy, on short, level grass, and the views both near and far are magnificent. Looking back towards Gorran Haven there's a splendid retrospective vista of the cliffs and slopes above Perhaver Beach, backlit by the sun at this time of day and seen across a shimmering sea. More of St Austell Bay is revealed ahead and you can see that a change is coming, for the coast from here on is much more populous than the wild country you've been crossing over the last two days. 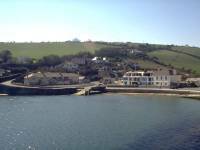 Mevagissey will be coming into view, but the most prominent features are the Par china clay works and St Austell itself, which lays a couple of miles inland. 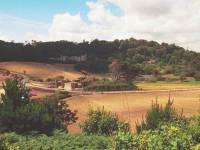 Away from the coast is a curious landscape of spoil heaps, the legacy of Cornwall's mining and quarrying industries. 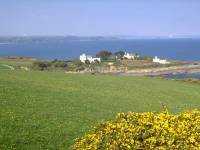 Beyond Par is the prominent headland of Gribbin Point with its red and white tower, and further east you should see the higher reaches of Polurian, opposite Fowey, two days' walk ahead. 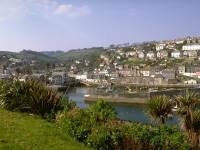 Onwards again are the cliffs and coves of the coast around Polperro and Looe, and finally the coast sweeps round to Rame Head - just six miles short of Plymouth. 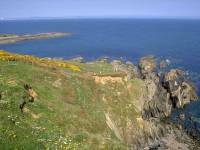 Chapel Point itself is a complex little promontory and actually boasts several significant headlands. 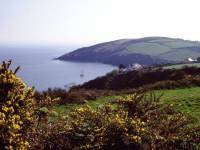 First you reach Payber Point, facing south, from where you get a final view of Gorran Haven a mile and a half behind you. 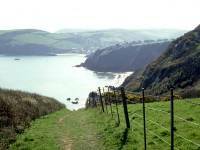 Then comes Turbot Point, by which the coast path tackles a very steep downward gradient beside a fence. 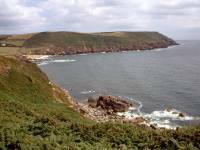 Finally there's Chapel Point itself, a low shelf of rock jutting eastwards into the sea just north of the tiny Colona Beach. Chapel Cove is lovely. 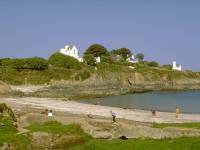 The coast path drops steeply to sea level at this sheltered, east-facing bay which contains the tiny and secluded Colona Beach. 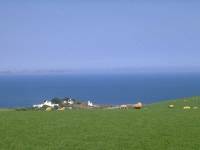 There's a pleasant and colourful jumble of rocks to either side, and lush green pastures sweep away from the cove on three sides. 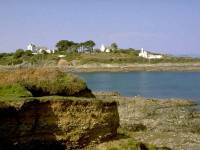 The cove is crowned, however, by the three white houses that stand on Chapel Point itself. 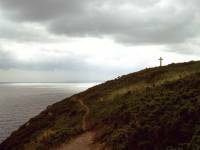 According to the official coast path guidebook they were built in the 1930s by architect John Campbell. Whoever lives here is very lucky. 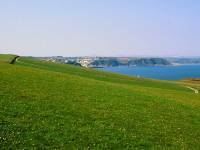 From Chapel Cove there's a simple walk of just under a mile to Portmellon, partly across grassy pastures and partly along Chapel Cove's access drive. 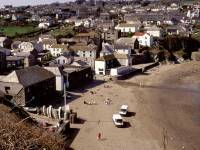 Portmellon is an outlier of Mevagissey. 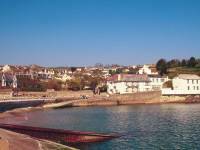 It clusters around the tight little bay of Portmellon Cove, and the road sweeps right round behind the sea wall and is prone to tidal flooding. 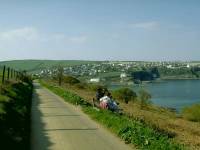 Go around the bay and continue to follow the road, up to the steep little headland of Stuckumb Point between Portmellon and Mevagissey proper. 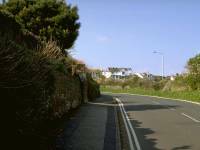 There's a short stretch of residential road above Stuckumb Point before you round the headland and see Mevagissey spread out before you. 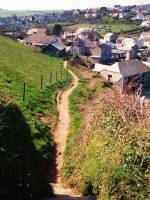 The lane drops steeply into Mevagissey. 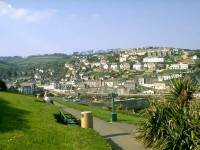 You can avoid it by hopping across into some public gardens on the seaward side, which reward you with some excellent views of the town. 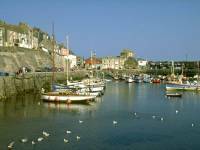 The harbour is very busy and features both inner and outer walls; the outer walls were built to enlarge the original harbour sometime around 1890. 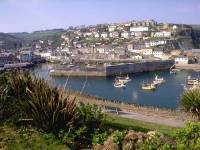 Mevagissey is journey's end for today, and is the biggest place on the coast path since Falmouth. 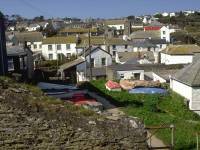 It's a place of lanes that are impossibly narrow and often quite steep, where cottages and businesses and workshops are shoehorned in amongst each other and interior spaces are tiny. 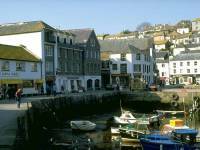 It's what I call "quart in a pint pot" architecture, and it's by no means unique in Cornwall; you will already have caught a flavour of it in Mousehole, but Mevagissey is the first of four prime examples (the others are Fowey, Polperro and East Looe). 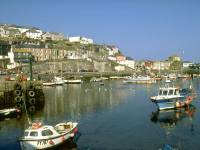 Mevagissey is also the first town on the coast path to target the tourist aggressively. This has its good points and its bad points. 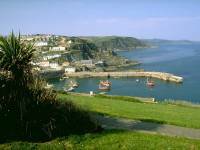 Among the good points are that Mevagissey has every facility you could need; accommodation, food and drink, shops, banks, public transport, late opening. 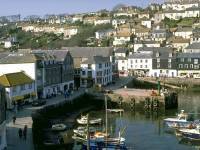 The bad point is that Mevagissey pitches itself downmarket. 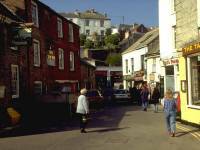 Rather too many of the town's shops are given over to the business of offloading tat onto daytrippers - just how many baseball caps, sunglasses, and novelty ceramics emblazoned "I've been to Mevagissey" do you need? 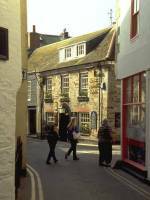 But there is plenty of charm here nonetheless, and the harbour and the lanes invite exploration. 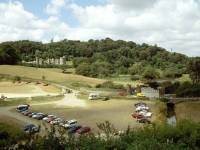 There's a museum and a model railway, and a good variety of foodstuffs; pasties, fudge and ice cream all seem to be in plentiful supply. Buses call at a small halt in the town centre, though traffic conflicts are a way of life here and you may find it more amenable to wait at the shelter a few hundred metres away from the harbour on the St Austell road, where the narrow lanes end and the town's suburbs resume more normal proportions.